Go See This contributor Miriam Dafyyd reviews Tate Liverpool's Life in Motion: Egon Schiele/Francesca Woodman exhibition. Running until 23 September, Tate Liverpool are currently playing host to an exhibition exploring the works of Francesca Woodman and Egon Schiele. Go See This contributor Miriam Dafyyd, shares her thoughts on the works of this unlikely duo. I have enjoyed the Tate Liverpool’s recent thought provoking pairings for their top-floor shows, which draw connections between two artists or movements that aren’t always obvious. In the past they’ve hosted shows like Maria Lassnig with Francis Bacon, or Egyptian Surrealism with John Piper. I find that they’re good food for thought and can spotlight deeply interesting artists and movements that have been overshadowed by more famous peers. 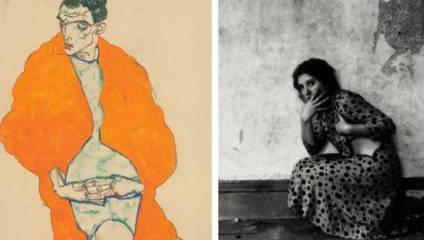 This summer, the Tate have paired Egon Schiele, the Austrian figurative artist, with Francesca Woodman, an American photographer in Life in Motion. Egon Schiele died at the age of 28 exactly 100 years ago in Vienna in 1918, but in the century since, his work hasn’t lost any of its potency. He’s well known for captivating drawings of figures, often very gaunt looking, placed in positions that at first seem awkward. The more time one spends looking, the more that these seemingly still and quiet pictures burst into life. What Schiele achieved was to create an image of the human body that didn’t represent the model inch for inch, but delved deeper to create a vision of the mind within the body too. The artist lived in Vienna at the same time Sigmund Freud was exploring the complicated human mind, and Schiele sought to reflect a spectrum of emotion in his images – from fear and angst to wild passion. His figures are a little distorted – their hips are jagged, their muscles bulge and dip in extremes. Their skin is sickly, mottled with yellow, burgundy and blue. These bodies look close to death at times but looking eye to eye with Schiele’s men and women reveals something of their emotionally charged existence, and even something of his own. I’ve seen Schiele’s works in the flesh a few times and find that I never tire of looking at them, always trying to unpick what the figures are feeling and thinking, and never quite managing it. Placed alongside Schiele is an American photographer, Francesca Woodman, who was working much later, in the 1970s. Like Schiele, her images are of the human body, drawing you in with their strange beauty. While Schiele’s images aren’t huge, they dwarf most of Woodman’s precious, jewel-like black-and-white photographs, each about four inches square, but stuffed full of spirit. There’s a certain Alice in Wonderland feel to the images, Woodman and the women she depicts are in dilapidated houses, wallpaper decaying, wood scratched, all contrasting with the spectral brightness of their figures. Because of the exposure times whilst taking the photographs, Woodman’s images of the body are often out of focus. Sometimes their faces are out of view, or their bodies are just about visible in a blur of movement. These, like Schiele’s figures, suggest a deeper feeling through their bodies, a complicated mix of emotions that we’re left to unpick. It isn’t a huge exhibition, but there is a wealth of works to look at. While I’m undecided on how well both artists’ work spoke to each other, I did enjoy the chance to compare Schiele and Woodman and to look at them individually. I believe that Tate Liverpool’s two-for-one exhibitions are great opportunities to indulge in the big-names like Schiele, while discovering lesser-explored, glowing talents like Woodman.